Analyzing the application efficiency of irrigation systems is important to identify enhancements already achieved and potential places where improvements can be made. Application Efficiency (AE) is a performance criterion that expresses how well an irrigation system performs when is operated to deliver a specific amount of water. AE is defined as the ratio of the average water depth applied and the target water depth during an irrigation event. The average water depth is the average height of water applied in a field during an irrigation event. The target water depth is the desired water to be supplied in a field during an irrigation event. For this research, the target water depth is the low quartile depth, which is the average of the depths in the sections of the field that receives less water than the rest of the field (percentile < 0.25). The research and products provided in this webpage are the results of an analysis of Irrigation Surveys (2001 & 2010) combined with theoretical AE values for different irrigation systems (Furrow, sprinklers, drip irrigation, etc.). The combination of these data sets resulted in the spatial and temporal analysis of application efficiency (Figure 1) that has been stored in the California Irrigation Information System (CALIIS) which is a geographic information system that contains data and results of this analysis. An abstract is available to provide a concise description of the project and results obtained. The maps and results presented in this project are documented in a report. First, the report provides a brief review of efficiency criteria used in irrigation. Then, it describes the framework, methods, statistical analysis, considerations and limitations of the application efficiencies presented in maps. 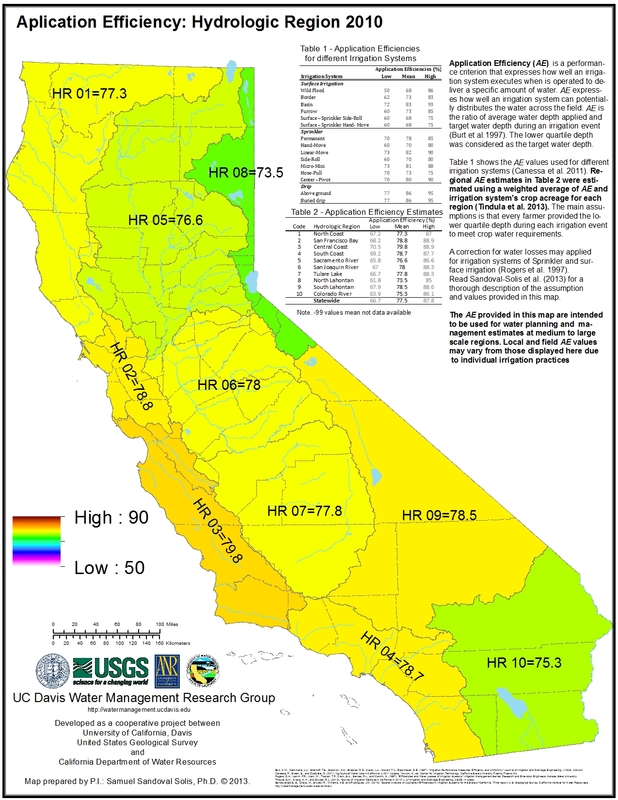 The report shows results of low, mean and high AE values by hydrologic region and by crop. 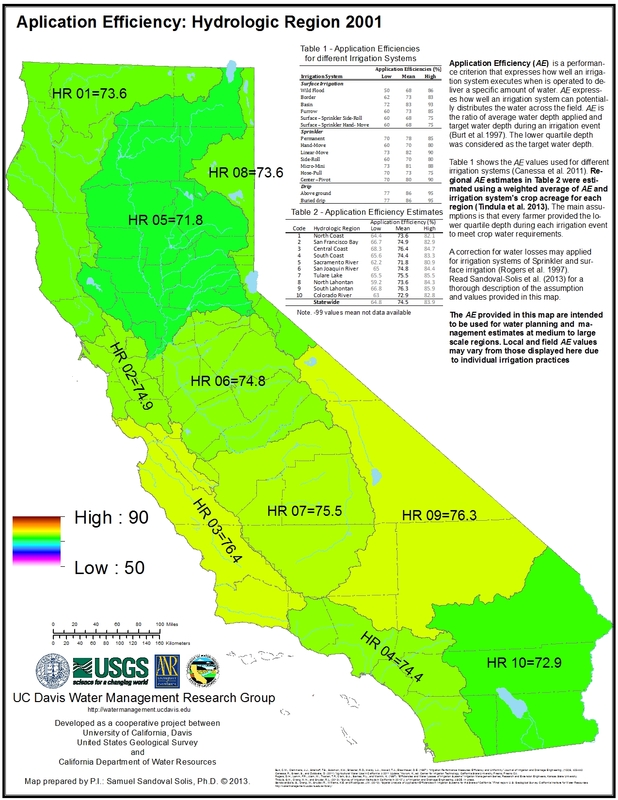 The report includes 42 maps of application efficiencies for the 10 hydrologic regions of California: 2 regional maps (2001 and 2010) plus 40 maps for 20 different crops (20 maps for 2001 and 20 maps for 2010). The Report also include a tutorial, in appendix A, that explains how to use CALIIS. The research analysis, report and geodatabase presented in this webpage were part of a collaborative project between: University of California Cooperative Extension, University of California, Davis (Department of Land, Air and Water Resources), California Institute for Water Resources and California Department of Water Resources.